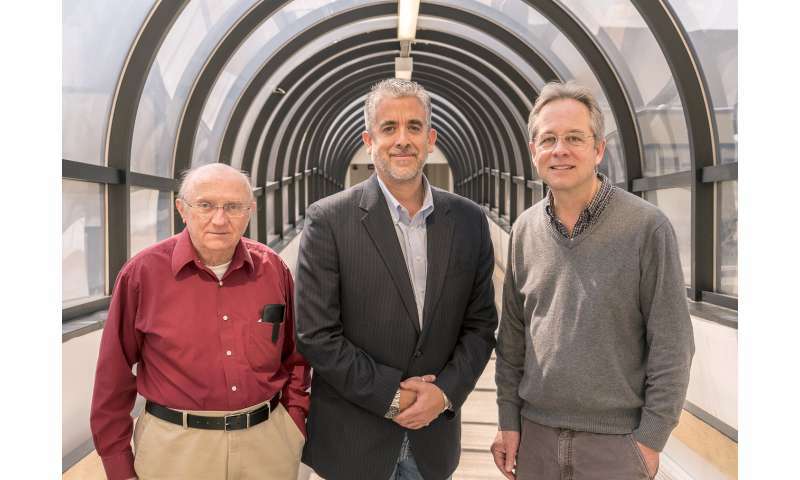 A team of scientists at the U.S. Department of Energy's (DOE) Princeton Plasma Physics Laboratory (PPPL) has won a DOE Office of Science award to develop new X-ray diagnostics for WEST—the Tungsten (W) Environment in Steady-state Tokamak—in Cadarache, France. The three-year, $1-million award will support construction of two new devices at PPPL, plus collaboration with French scientists and deployment of a post-doctoral researcher to test the installed devices at CAE Laboratories, the home of the WEST facility. "We are extremely proud that our proposal was chosen considering that there was strong competition from our community," said PPPL physicist Luis F. Delgado-Aparicio. "Developing innovative X-ray diagnostics will allow us to push technology ahead and give us a great opportunity to be part of an incredible team of French scientists and engineers at WEST." Other scientists on the team include PPPL diagnostics division head Brentley Stratton and principal research physicist Ken Hill. WEST is an upgrade of Tore Supra, a large facility with plasma-facing components that use carbon, like those in the National Spherical Torus Experiment-Upgrade (NSTX-U) at PPPL. Researchers at WEST have replaced the carbon components with those made of tungsten, a material that can withstand the superhot temperatures of fusion plasmas without absorbing gas from the plasma; the gas can be released and degrade plasma performance. One diagnostic, called the "Multi-Energy Hard X-ray (ME-HXR) Camera," will measure X-ray emissions over a broad energy range from the plasma that fuels fusion reactions. Measuring the soft, or relatively low-energy, X-ray emissions will let scientists determine the plasma's temperature and electric charge. It will also enable them to figure out exactly how densely and where heavy elements that could slow the fusion reactions are scattered within the plasma. Such information could be useful for a variety of experiments. The camera will also measure the plasma's hard, or high-energy, X-ray emissions, which stem from the collisions of background ions with high-energy electrons accelerated by a radio frequency (RF) system known as the Lower Hybrid Current Drive (LHCD). These electrons carry the current in the WEST plasma. The spectrum of the hard, non-thermal emissions will provide information about where these fast electrons absorb RF energy. The camera will also probe X-ray emissions from the tungsten metal tiles that will cover the interior of the tokamak. That information will reveal whether the machine's extreme heat has been dislodging tungsten atoms from the tiles and propelling them into the plasma. The presence of tungsten atoms in the plasma could indicate that the tungsten components are starting to melt; monitoring the tungsten content is therefore crucial to preventing damage to the machine. The other diagnostic, known as the "Compact X-ray Imaging Crystal Spectrometer (cXICS)," is a variation of a device that Hill and senior physicist Manfred Bitter invented for PPPL's National Spherical Torus Experiment (NSTX) and the Alcator C-Mod tokamak at the Massachusetts Institute of Technology (MIT). The cXICS device will create a low-resolution, two-dimensional cross-section image of the plasma showing the general location of impurities, including argon, molybdenum, xenon, and tungsten. "These are two different but complementary instruments," Delgado-Aparicio said. "They will provide vital information about the plasmas in WEST—which can inform future fusion devices." The planned design and delivery of the two new instruments "builds on long-term expertise on X-ray diagnostic development at PPPL," Stratton said. "This laboratory is known quite favorably for its X-ray diagnostics research, and we want to continue that."